The statement that “Content is King” will remain forever, but if it’s King then backlink is Queen and without Queen, King is incomplete. If you’ve good quality content with few high quality backlinks, then you’re going to rock. But after the arrival of Google penguin, the game has changed; penguin proved itself a nightmare for link spammers and has cleaned all spam websites from the search results. Many are keep saying that “SEO is dead” but it’s wrong, because the backlinks are the plinth of Google’s search algorithms. It’s not easy for Google to pull the concept of backlinks out of its search algorithms, may be after few decades it will be successful in doing this but not in the next five years at least. So take a deep breath and let’s start this guide in which I’m going to tell you about few methods to create backlinks from Wikipedia. First I would like to describe the meaning of quality backlink; it’s a backlink that’s created on a trusted and good authority website and looks natural and relevant. The previous sentence reveals the secret of quality backlink; you should keep it in mind before making a backlink. Backlinks from Wikipedia.org are always nofollow, but undoubtedly they have more authority than small websites. A case study, done by brian gilley on his blog, concludes that nofollow link doesn’t pass PageRank but surely it helps a blog to rank higher in search results. Moreover, Marcus miller and many others also think that nofollow links increase trust and help websites to rank higher. Hence proved, that Wikipedia links worth more than our thoughts. Without wasting time, let’s start the guide. Wikipedia.org is open for every content creator that can add some value in Wikipedia’s authority and has something new in his pocket, that Wikipedia doesn’t have already on it. If you’re the one who can meet their quality guidelines then this method is especially for you. First of all, create an excellent piece of content on your own blog and then write related to it on wikipedia and in the external links section add your blog’s link; or you can also add your blog’s link in the references section of the article. 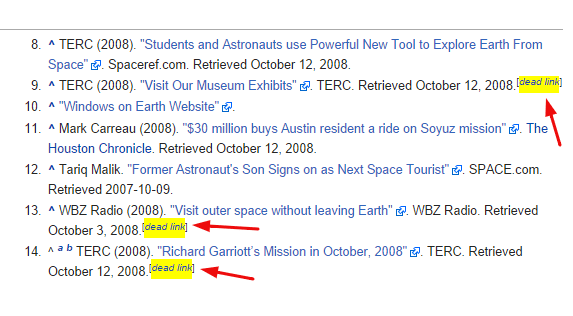 Wikipedia is hub of broken links (Tagged as dead link); you’re just required to find a dead link in an article that is relevant to your blog/website and replace it with your one. The dead links are because of websites to whom Wikipedia is linking and they don’t exist or the linked pages have been removed. Wikipedia allows anyone to add useful resources in the “External Links” section. Just find a topic related to your blog post on Wikipedia and place your link in the external links, but don’t add more than one link to same blog, and also don’t use weird anchortext otherwise their quality team will throw your link out of Wikipedia’s library. If you don’t have time to write full length article, you can simply add information to already published article on Wikipedia. I’m using this tactic from past few years and I feel it the most powerful among all (In the conclusion, I’ll share the reason of its powerfulness). Just search any topic relevant to your niche and find out what’s missing in the content (I’m talking about the body section), add that content to your blog first and after that add the same information to wikipedia (Don’t copy/paste of spin) and add your backlink as a source to the content. About first: Writing a full length article has many drawbacks, like there are high chances of rejection if it’s low quality and your added page will not have good page authority (Because it’s new), so the link’s value will be lower than the other three. Second: You’ve to create relevant content for the dead link on your blog, if you fail to do so, Wikipedia’s team will love to make the link dead again instead of adding your low quality resource. Third: Backlink coming from external links section doesn’t look natural and can be exposed rapidly in front of the team if it’s low quality. Fourth: This one will save your time, because you’re just required to add few sentences and the link will be yours’. If the page, where your backlink lives, is older and have good page authority, then its quality is obviously higher than other links. Zunair Rafiq is CEO of smspunch.com, that’s a website to send free sms from internet. He loves to bring new ideas about iOS and Android. Moreover, he is teaching SEO to his employees for past 2 years. Getting a backlink from Wikipedia is a high return to any site. Thanks for sharing the information with step by step.